Although steamboats operated mainly in coastal North Carolina, they were used for a short time on the French Broad River, high in the mountains. On 3 Feb. 1881 the General Assembly granted a charter to the French Broad Steamboat Company, empowering it to operate a steamboat "on the French Broad River and any of its tributaries within the counties of Transylvania, Henderson and Buncombe." The president and guiding force of the company was Hendersonville attorney Col. S. V. Pickens, who granted the contract to build a steamboat to Thomas W. Godwin & Company of Norfolk. The contractors sent an experienced boatbuilder to Hendersonville to superintend construction of the new boat, which was to be named the Mountain Lily. The Mountain Lily was a side-wheeler, powered by two 12-horsepower engines. One account gives its dimensions as "55 feet long and 18 feet wide," with a "draft of more than three feet"; other sources give the boat's draft as 18 inches when loaded. Its capacity was said to be 100 passengers. Congressman Robert B. Vance, meanwhile, was able to get an appropriation to blast out rocks and shoals in the river and construct jetties to narrow the channel and deepen the water level. The owners dreamed of running their boat from a point near Hendersonville to Brevard and even to Asheville. Residents of the area were proud of the little steamboat, claiming that it was "the highest boat line in the world," as it operated at an altitude of 2,200 feet. The Mountain Lily was running by the summer of 1881. The river level was reportedly the lowest it had been in 25 years, though, and its trips were mainly short excursions. The army engineers working on the river began building jetties, but heavy rains that year clogged the jetties and much of the channel with sand and mud. The Mountain Lily was left stranded on a sandbar at King's Bridge and was finally abandoned. In 1885 a Captain Farmer reportedly built two small steamboats that were powered by the Mountain Lily's engines. 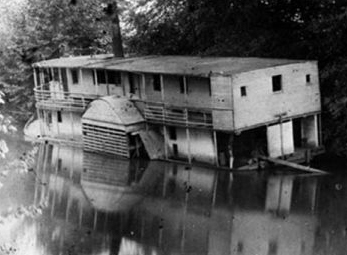 These unprofitable boats were also abandoned, and with them went the dream of steamboat service on the French Broad. The remains of the Mountain Lily could be seen in the river as late as the 1930s. Sadie S. Patton, "Steamboat Trips in the Mountains," The State (18 May 1940). "Steamboat Once Popular on French Broad River," Raleigh News and Observer, 18 May 1940. "The Mountain Lilly, Hendersonville, N.C.."c.1880's - 1920's ; Hendersonville, NC Image courtesy of Jody Barber Photographic Collection, D.H. Ramsey Library Special Collections, UNC Asheville. Available from http://toto.lib.unca.edu/findingaids/photo/barber/pages/lily_riverboat.html (accessed July 3, 2012).